adjustment, especially adjustment of the eye for seeing objects at various distances. This is accomplished by the ciliary muscle, which controls the lens of the eye, allowing it to flatten or thicken as is needed for distant or near vision. 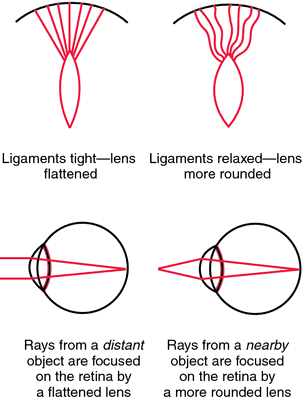 Flattening and rounding of lens during accommodation. absolute accommodation the accommodation of either eye separately. amplitude of accommodation range of accommodation. histologic accommodation changes in morphology and function of cells following changed conditions. negative accommodation adjustment of the eye for long distances by relaxation of the ciliary muscle. positive accommodation adjustment of the eye for short distances by contraction of the ciliary muscle. the difference in refractivity of the eye at rest and when fully accommodated. the total accommodative power of the eye, determined by the difference between the refractive power for farthest vision and that for nearest vision. the total amount of accommodative power of the eye. changes in morphology and function of cells following changed conditions. For these preschool-aged children, the average objectively measured accommodative amplitude was about half of the subjectively assessed amplitude. Accommodative amplitude determination: pull-away versus push-up method. Subjective and objective measurement of human accommodative amplitude. This testing was conducted at the discretion of the attending optometrist and may have included additional accommodative testing (positive/negative relative accommodation, fused cross cylinder, accommodative amplitudes, accommodative facility) and vergence testing (distance and near lateral and vertical phorias, distance and near convergence and divergence ranges, vertical vergence ranges). Dual optic AIOL designs have been developed to overcome the dependence of potential accommodative amplitude on refractive error (and optic power), which limits single optic AIOLs. Five of the patients exhibited accommodative dysfunctions, with all five manifesting reduced accommodative amplitude and two exhibiting slowed accommodative facility . Static parameters included push-up and minus-lens accommodative amplitude, relative accommodative ranges (PRA/negative relative accommodation [NRA]), accommodative stimulus/response (AS/R) function, AC/A ratio, near heterophoria, and tonic accommodation (see Appendix for ophthalmic glossary, available online only). Push-up accommodative amplitude was measured in free space using the line of 20/30 letters on a reduced Snellen chart as the target . Accommodative amplitude was the next parameter assessed. Association between accommodative amplitudes and amblyopia. Norms for accommodative amplitude are given in Table 4.
copying from board) Accommodative amplitude Low Normal Accommodative May be slow with Poor facility minus lenses Accommodative Need high Normal lag plus (>+0.